My inbox and Facebook comments are awash with angry protestations about my article on law enforcement fatalities and my follow up post on police assaults and injuries. This is a charged and complex issue, and there are many different ways of looking at it, so I anticipated this. Here are some notes about the methodology I used to study the question. First, to be clear, what is the question? The title of my original Freeman article was “How dangerous is it to be a cop?” My sub-questions were “is it getting more dangerous?” and “does it justify the militarization of law enforcement?” Many people think violent crime is on the rise, and I’ve seen people claim that things are uniquely dangerous and getting worse for cops today, and that is why they need this kind of equipment. Begin with the first question. There are lots of different ways to approach it. I used six: absolute fatalities; fatalities per capita; comparative fatality rates of different professions; comparative homicide rates; assault and injuries per capita; and percent of officers assaulted/injured. First, absolute fatalities of law enforcement have been on the decline for several decades, not adjusted for the population or relative to the total number of sworn officers. This historical data comes from the National Law Enforcement Officers Memorial Fund. 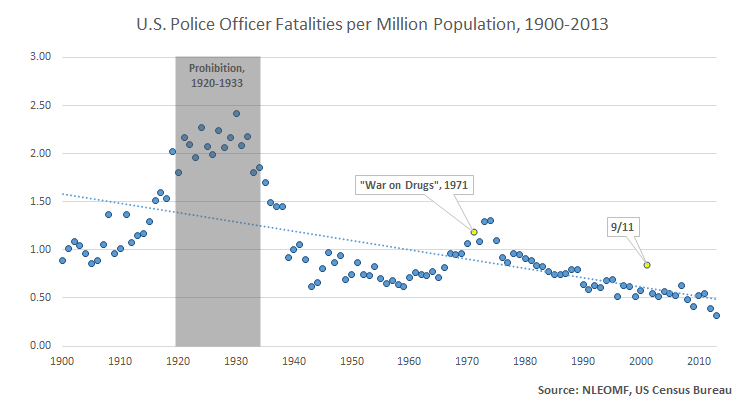 This is telling in itself, but the 297 officers who died in 1930 during alcohol prohibition, when the US population was less than half of what it was today–or the 280 who died in 1974, when it was two thirds what is now–is a proportionately much more serious issue, not revealed by this chart. Next I looked at officer fatalities per million of US population, to see if, as a share of the population being policed, fatalities are rising or falling. 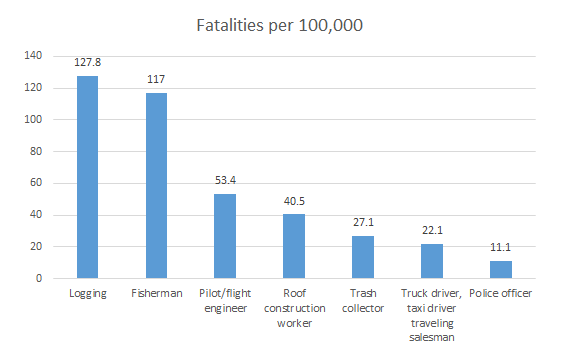 But we should also look at the fatality rate within the profession to get an accurate assessment of its risk. According NLEOMF, today there are over 900,000 sworn officers in the United States, more than at any other time in US history. According to their records, 100 officers died from work-related injury in 2013. 100 deaths out of 900,000 officers gives us a fatality rate, conservatively, of about 11.1 per 100,000. Compared to retail cashiers, this is high. However, compared to other risky professions, it’s far from extraordinary. But when we talk about how dangerous it is to be a cop, we often mean something more specific than “how likely is it you’ll die”; we mean “how likely is you’ll be killed.” We tend to assume that police officer fatalities are all homicides, but this isn’t true. A lot of officers die in vehicle crashes or other accidents, or they get a work-related illness. According to data from the FBI, from 2003-2012, just about a third (34%) of police fatalities were the result of felony killings. 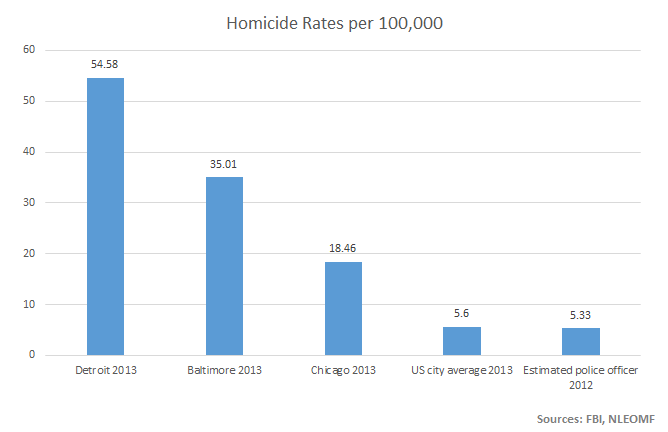 Comparing the police murder rate to the national average for cities and specific cities is also somewhat revealing about the relative risk of being killed. They say that while police fatalities may be decreasing, this is only because of kevlar (which became common in the late ’80s) or better medical care, but meanwhile attacks on police are increasing or increasingly dangerous. So let’s take a look at the data on assaults and injuries suffered by police. Unfortunately, the FBI data just don’t bear this hypothesis out. It is, of course, undeniable that vests and better treatment have played a role in reducing fatalities, both for police and for everyone. 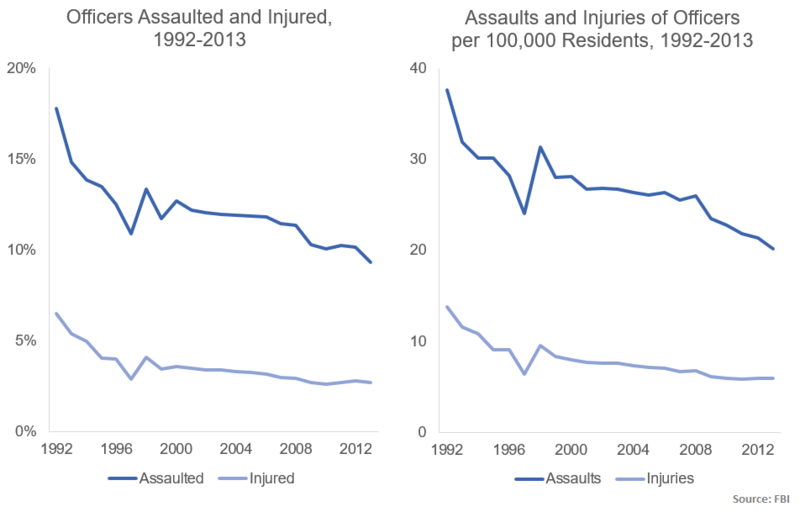 But injuries and attacks suffered by police have been slowly declining for 15 years. Police are dying less frequently because of better medical care, yes, but they are also being assaulted and injured less to begin with. The final bit of criticism I’d like to mention is that I failed to address causality. 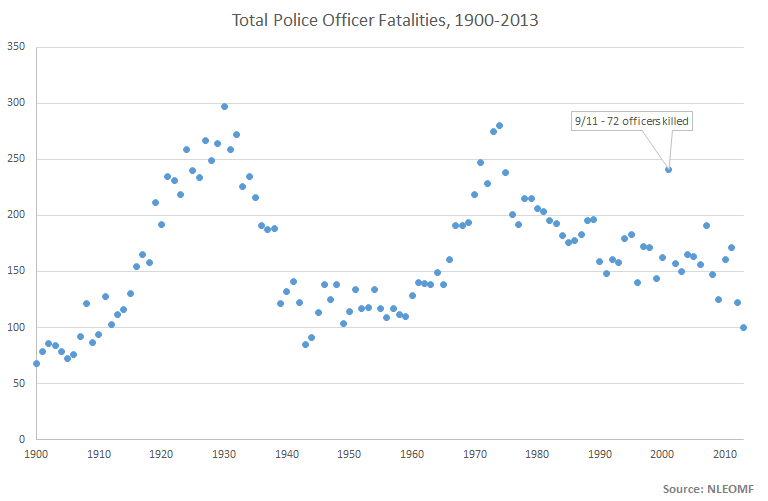 Why are police fatalities declining? Why are cops being assaulted less? This was intentional. I am deliberately agnostic about the question of what is causing these declines. I don’t know for sure, and I’m open to argument, but this data and these trends do not fit with the narrative that we live in an increasingly dangerous world, in which cops and sheriffs need mine-resistant vehicles, .50 caliber machine guns, military assault rifles, and green camouflage battle-dress uniforms to do their jobs. Nor does the data fit with the suggestion that the militarization of law enforcement itself caused the decline in fatalities, as the decline long pre-dates the Pentagon’s 1033 program, begun in the mid-90s, or the post-9/11 Homeland Security bonanza. Part of the problem is the difficulty of measuring how “militarized” cops have become over time, but if you’re going to say that the data support your claim, you have to show where in the numbers this effect appears. No one has yet done so. I have yet see any evidence that police officers need equipment designed for soldiers fighting wars in order to keep the peace. I do see evidence that the martial mentality in police departments around the country is alienating the public, creating tensions with citizens, and escalating conflicts. But the burden of proof is not on me; it’s on those who want to arm cops like soldiers, tell them they’re fighting a “war”, and turn them loose against the “enemy” of their constituents. 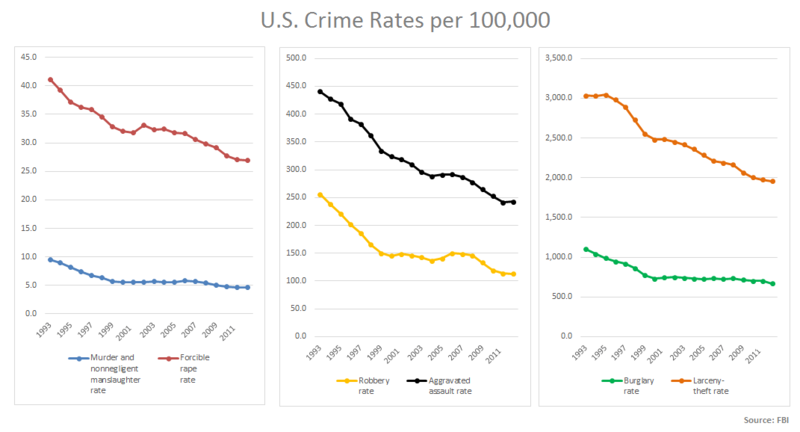 However, I will begrudgingly speculate about one possible reason police fatalities and assaults are declining: all crime is. Everyone is safer than they used to be, not just police. But since cops’ jobs are directly linked to crime rates, you would expect if violent and property crimes are going down, their job gets easier and safer. And that does fit the data. It’s by no means a complete theory, as the decline in fatalities starts before crime peaked in 1990, but there’s compelling reasons to think it had an impact, although just how much is hard to tease out. I am not ideologically committed to this conclusion. If you find an error or something I missed, please contact me, and I will make an update accordingly. This post has been updated to add additional information and correct some grammatical errors. This post has been updated to update and expand some charts.